The courtroom remains open to the public upon presentation of a state ID card, which is retained by court authorities for the duration of the session, until all audience seats in the courtroom are filled. Few journalists and spectators showed up in court today. Present at the hearing was defendant E. Boukouras. The witness was examined in turn by defense counsels Pantazis, Karydomatis, Oplantzakis, Michalolias G., and Roussopoulos. The witness, in order to explain the fact that he called Boukouras a “coward” during the incident in Dervenakia, said that he thinks it is cowardice to take advantage of the presence of so many people that he has brought with buses etc., against one person [:New Democracy MP Tagaras] who had done nothing to provoke him and didn’t even have his security detail with him. The witness also pointed out that when he talked in his pre-trial testimony of the group or entourage of Boukouras he meant the same as when he said “squad” during his present testimony. The witness thinks that the behavior of the Golden Dawners was milder in Chiliomodi than in Dervenakia, because instead of shouting slogans such as “bastards–traitors–politicians” they were merely doing about turns obeying military orders. The witness is a police officer and had testified during the pre-trial stage about the incident involving Ilias Stavrou [:a witness that is scheduled to testify in a later hearing]. This was because Stavrou mentioned him in one of his preliminary testimonies. According to the witness, Stavrou wanted him to have a hard time, since he believed that the witness hadn’t been a good friend to him. 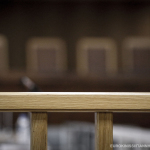 Stavrou has testified that he wanted to leave the ranks of Golden Dawn but that he had received threats in order to stay. Stavrou had been friends with the witness when they were still in school in Veroia. Their relations were untroubled up to 2013. One of the reasons why their friendship became strained was because Stavrou, had become a member of Golden Dawn since 2004 or 2005. His character had undergone a significant change and he had become much more stressed. He had been on the Golden Dawn ballot in Imathia for the 2012 elections. According to the witness, Stavrou could talk about nothing else but Golden Dawn “how they were the ones that would save Greece”. The witness said that “You don’t want to be close to a person that has taken this way of life”. 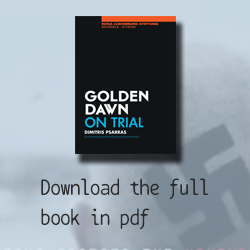 In 2013 Stavrou told him that he wanted to quit Golden Dawn, and the witness –without making too much of it, since their friendship was already strained– simply told him that this was a decision he should have taken a long time ago. 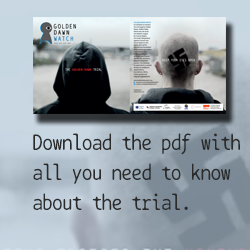 Stavrou had told him that he had been threatened by Golden Dawn and that he didn’t tell him the things that were happening so that the witness wouldn’t become a target of Golden Dawn as well. Stavrou didn’t go into details about the threats he had received. The witness stated that he urged Stavrou to inform the party that he intended to quit and then, if they bothered him, to go to the police. 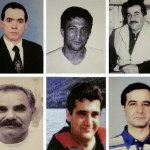 The witness answered questions in turn by civil action counsels Sapountzakis, Theodoropoulos, Vrettos, Papadopoulou, Kabagiannis, Skarmeas, and Papadakis. According to the witness, the crowd that Stavrou ran with, members of Golden Dawn “weren’t exactly the best people” and “ever since he entered the party he was always getting in trouble, and the reason was the place he was in”. Stavrou had told him that “You just can’t leave Golden Dawn like that”. He was a scientific consultant of Golden Dawn and so he must have known what was going on behind the scenes, and he used to smile ironically and say that “they don’t have internal problems”. When asked if Stavrou was of a sound mind, the witness answered that he was. The witness answered questions in turn by defense counsels Michalolias G., Michalolias N., Alexiadis, and Roussopoulos. 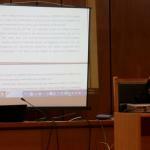 The witness stated that Stavrou, after their friendship started dissolving, had started making insulting posts about his person on Facebook. The witness thought that some of them could also be called threatening. The witness stated that in the period leading up to Stavrou quitting Golden Dawn, when he was receiving threats, he had been terrified. Stavrou had never mentioned any other phobias. He had wanted, though, to be closer friends, and tried many times to intrude into the witness’s personal life. The witness works as a high school teacher. In 2011-2014 he was the mayor of Nemea, and now he is a member of the municipal council and leader of the opposition. The witness didn’t know Boukouras personally, despite the fact that Boukouras hails from a village in Nemea, because he was living in Athens. The offices of the Nemea chapter of Golden Dawn opened at the end of 2011. Up until the 2012 elections there had been no incidents in the area. Golden Dawn organized a few speeches and once, after the elections, a rally. He was away at the time and when he came back the rally had finished. He was informed that the rally had been attended by people that weren’t residents of Nemea, dressed uniformly in black t-shirts etc. An old man told him “We haven’t seen things like this since the [:Greek] Civil War”. Later in 2012, the witness was with some friends of his, watching the result of the parliamentary elections, when he received a telephone call from Boukouras. Boukouras announced to him that he had been elected as a MP for Korinthos, and the witness congratulated him. Then, Boukouras told him that from now on the witness would be his subordinate. The witness told him that he had his facts all wrong, but that he was young and he would learn. Then Boukouras told him that he would become the witness’s shadow and that the witness would see him in his dreams. The witness said no. Until then, there had been no altercation between the witness and Boukouras to warrant such a thing. The witness was given the impression that during the phone call Boukouras was with some other persons that were listening in on the conversation. This suspicion was later confirmed. After the incident, the witness talked about the matter with his colleagues in the municipality and, afterwards, contacted the district attorney and the Korinthos chief of police. The witness asked that Boukouras should be warned, so that he wouldn’t bother him again and also said that he should be held responsible if anything happened to him or his family. He didn’t check if Boukouras was indeed warned and doesn’t know what happened. The witness later organized a press conference in order to lay out in the open what had taken place, and because he had to show that he wasn’t afraid. Responding to a relevant question, the witness stated that if someone had phoned him from another party telling him the same things, his reaction would have been the same. The witness believes, given the general political climate when he was mayor, that at the time there was heavy presence on the part of Golden Dawn. He doesn’t think it natural for a party to hold rallies with slogans etc., in Korinthos or Nemea, which has a population of 4,000, and turning against the immigrants in such an ugly fashion. The witness went on to refer to an assault against some Romanian workers. More specifically, about 10 persons wearing helmets and carrying wooden clubs went to beat them up, because they had complained about unpaid wages. The witness arrived after the incident had taken place but he was told about what happened by other people who were present. He recognized one of the ten persons that had participated and told him “What do you think you’re doing, we’re just a handful of people”. The witness didn’t see if anyone had been wounded. 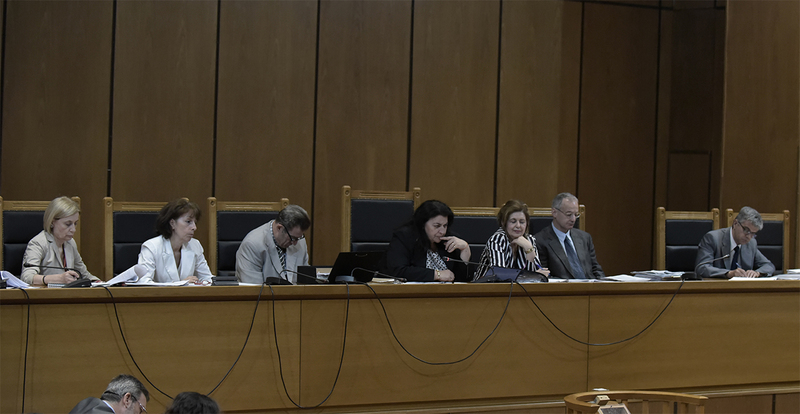 The witness answered questions in turn by civil action counsels Theodoropoulos, Vrettos, Malagaris, Sapountzakis, Papadopoulou, Kabagiannis, Skarmeas, and Papadakis. 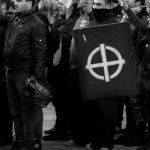 The witness clarified that the person that he identified in the incident against the Romanian workers was a member of Golden Dawn. He also said that the Romanians did not use force during the incident. The witness, acting like he did after the threatening phone call by Boukouras, wanted to send a message to Boukouras and the community, that the institutions still held. 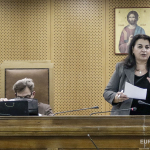 He explained that Boukouras did not introduce himself as a cooperating or independent candidate on the Golden Dawn ballots, but as its MP. He never apologized about his behavior. As for the rallies, the witness said that similar tactics had been used during the German Occupation and the Civil War by the Greek assault squads. He also said that the Nemea chapter of Golden Dawn has closed down, maybe because of the prosecution following the murder of P. Fyssas. Responding to a relevant question, the witness said that the phrase “Asians and Africans pollute the white race” is inexcusable, which is a phrase that was heard in Hitler’s Germany. The witness was examined in turn by defense counsels Papadellis , Michalolias N., and Michalolias G.
Among other things, the witness stated that, operating in a democratic manner, he gave a permit to Boukouras to use a municipal hall to host an open talk about the garbage problem in the area. Concerning this matter, Boukouras has claimed that he has in his possession evidence of foul play on the part of the witness. The presiding judge adjourned for September 12th, 2017, at the Women’s Wing of the Korydallos Prison, when witnesses Alexandros Raptis and Maria Siakavara are expected to testify.